At their award ceremony held in Tokyo on the 13th June, Short Shorts Film Festival awarded Sing twice: first, the film took the Best International Short award, then it was named as the winner out of all three category winners: it took the festival’s Grand Prix. Representing Meteor Film at the ceremony and receiving the awards was director-producer Kristof Deák. The international jury lauded the actors’ natural performances and the timeless, culture transcending storyline, as well as the pacing of the storytelling. The Grand Prix also qualifies the film for Academy Award entry. 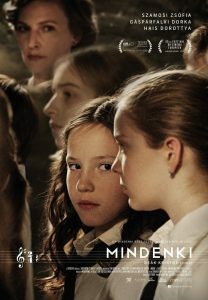 Los Angelesben Ember Judit-díjat nyert a közönség szavazata alapján Balassa László: Pozítiv sokk című filmje. Young people and adults can often feel misunderstood by one another. Kids may feel dismissed or aspire to act more mature, while their older counterparts are sometimes labelled as out of touch and uncool. This short-film programme explores what can happen when people of different generations overcome barriers using courage, communication, and mutual respect.